I was born on July 27, 1957, in Great Falls, VA. I was the youngest of five children, with three older brothers, Lad, George and Buddy, and the next youngest, my sister Patty, who is six years older than me. We lived on an 18-acre property in Great Falls called Dogwood Lane Farm. Ever since I can remember, all I wanted to do was ride horses. My parents tell me that my first word was 'horsy'. We would be driving in the car when I was about a year and a half old, I would look out and see a speck on the horizon about a mile away and say 'horsy, horsy!' when none appeared to be in sight; but sure enough, when we got closer, there would be a horse! Riding Amiga with my brother Buddy. I was totally horse crazy from the start. Perhaps it was my parents fault for naming me Phyllis, which means 'Lover of Horses.' I had a marvelous collection of Breyer model horses, and my mother built me fabulous barns for them. Problem was, I always had a few more horses than stalls, and had to find somewhere to put the extras. This is a problem I seem to have carried into my adult life with real horses, and still have today! I began my riding career at age three on my brother's cow, Jenny. She would be lying down in the barnyard, and I would go climb on her back and kick and whoop until she would get up and walk around. When she would get tired of the game she would lie back down, and no amount of persuasion would get her to her feet again, so I would have to get off. After that, I graduated to occasional rides on my sister's horse, a mare named Amiga. She was way too big for me to ride by myself, but sometimes I could coerce one of my older siblings into taking me for a ride. When I was four, Santa Claus brought me a pony for Christmas. I had been asking for one incessantly for about a year. One of my earliest memories is visiting 'Santa Claus's Pony Farm' at Thanksgiving of that year. Whenever we made the trip to visit my Grandparents in Charlottesville, VA, we passed this farm where they raised ponies, which my Mother always told me was Santa Claus's Pony Farm. This time, we stopped to take a look. Mom said 'Well, I'm sure Santa will not be able to bring you a pony, but just for fun, let's pretend. If he were to bring you one, which one would you want?' Without hesitation, I chose a little Shetland pony that was about a year and a half old. She was a sort of dappled brown color with very long hair, four white legs, a white stomach and one blue eye. I thought she was the most beautiful thing I had ever seen! Well, sure enough, on Christmas morning, I found this pony under the Christmas tree, literally, in our living room. I wasn't quite sure how she had gotten there, but my father explained that Santa Claus, being magic, had made the pony small, brought her down the chimney with the other gifts, and then made her big again. This explanation made perfect sense to me! I was ecstatic, and I named the pony Twinkle Toes. Twinkle Toes - I thought she was the most beautiful thing in the world. Twinkle Toes was about the most unsuitable pony imaginable for a small child, but I loved her. She would bite me and kick me, and when I rode her she would drag my leg along the barbed wire fence and lay down and roll on me. I used to regularly fall off her and lose my shoes and socks. I suppose I must have been very determined, since I didn't give up, and having an untrained pony at age four perhaps started my lifelong policy of training my own horses from the start. Eventually I outgrew Twinkle Toes, and she developed laminitis and couldn't be ridden, so my parents promised me a new pony for my seventh birthday. We went to a local horse dealer's stable, and he had quite a selection of nice and well-trained ponies for sale. I immediately spied a poor dejected looking half starved gray pony standing behind the barn looking pitiful, and I said 'I want that one!' Nothing my Mom or my older sister said could dissuade me, so against their better judgment, we came home with a five year old unbroken pony whom I named Buster Boy. The first week I had him he bucked me off and broke my collarbone, but we went on to have a great relationship for many years, despite his tendency to buck. On him I learned to jump, gallop and trail ride. I rode him in Hunter Shows for years, participated in 4-H, and spent many happy hours trail riding with my friends and their ponies. After I outgrew Buster when I was about 12, I taught lessons on him for many years, and kept him until he died at the age of 31. My first horse I inherited from my sister Patty when I was 12. She was a wonderful bay mare, mostly Thoroughbred, named Twinkles Parade, more commonly called Twinks. With her, I Foxhunted, did Hunter Shows, Pony Clubbed, and got my introduction to Eventing. She was a wonderful jumper out in the open and cross country, but in the ring she could stop in front of a fence so suddenly, I can't count the number of times I went flying over her head! She taught me an enormous amount, and went on to teach many other riders as well. I kept her also until she finally died at more than 30 years of age. My first serious Event horse was a homebred that I bought from my sister (my parents bought my ponies and my first horse, the rest were all up to me to buy!) when I was about 14. He was named Virginia Gentleman, but his stable name was Demon, which was perhaps fitting. He was quite nice to ride, but very bad mannered in the stable, with a tendency to bite and kick. When I first started with Demon, he didn't really want to go cross-country. I will never forget my first event, I had no jumping penalties cross-country, but 171 time faults. I jumped the first fence, and then the course went into the woods and down a hill. Demon wouldn't leave the start and go into the woods until the horse that started behind me went by, then we followed that horse the rest of the way around the course! I did work out my cross-country problems with Demon, and ultimately I Evented him through the Intermediate level. Unfortunately he got a severe case of colic, and died following surgery in 1975. 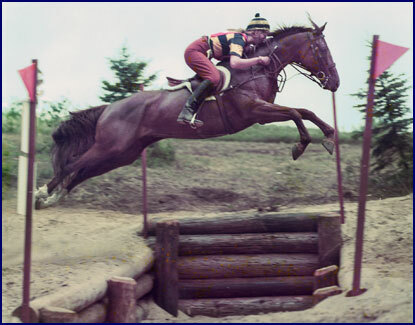 Demon and I beginning our Eventing careers in 1973. Not long after I started riding Demon as a teenager, I also bought a weanling named Royal Banner. He was the first horse I trained totally myself. He was very talented, but as I was just learning about training, I made many mistakes with him, and he used to run off with me regularly. He was a bold jumper, but very strong; I remember sometimes running him into trees to slow him down. I rode him in many Pony Club rallies and Events, eventually getting him up to the Intermediate level. Because of my inexperience I did not make the most of his potential, but I certainly learned a lot from riding and training him. I also completed the Old Dominion 100 mile Endurance ride on Banner; that was a great experience, and I finished in the top ten, completing the 100 miles in about 23 hours. Riding Royal Banner at the National Pony Club Rally. Shortly thereafter, I bought my next horse, Freedom Flight, as a replacement for Demon. He was a dappled gray gelding that I bought from Dr. Joe Rogers in Hamilton, VA. He hadn't done much at the time, but I fell in love with him at first sight (I have always had a tendency to do that when buying a horse). He went on to become my first Advanced level Event horse. One of my first Events with Freedom Flight After I graduated from Herndon High School in 1975, I went to the Potomac Horse Center in Potomac, MD, and took their Advanced Horsemaster's Course. After that I went to Unionville, PA as a working student with Bruce Davidson, leading American Event rider and two-time World Champion. I learned a tremendous amount from Bruce, and continued to work with him for many years. Bruce is responsible for much of what I know today. Under his tutelage, I moved Freedom Flight from the Training level to Advanced in a year and a half. I went on to compete him at the Advanced level for seven years, and gained a huge amount of valuable experience on him. Despite less than desirable conformation and terribly shaped feet, Freedom was one of the toughest and soundest horses I have ever owned. I think the experience I got competing Freedom Flight was largely responsible for my later successes on other horses. I was riding, training and competing a number of horses by this time, and have very fond memories of most of them. Tomorrow's Challenge, Lady Luv, Royal Banner, Timeless Flight, Shenandoah, and Storm Warning were some of the early horses I competed and learned on. One that will always have a special place in my heart is Mountain High. I bought him from Chip Embury in Upperville, VA. He was part Thoroughbred and part Percheron. He was a 17.2 hands gray gelding, and extremely strong and fast. He ran away with me most of the time! He was way too big, way too bold, and had an incredible charming personality. I moved him up through the levels, and gained an enormous amount of experience on him at the Advanced level. I rode him at the Boekelo Three-Day Event in Holland in 1985, which was my first experience riding with the United States Equestrian Team. Later in 1985, I went to England and bought Albany II. I moved him up to Advanced level in 1987, when he placed second in the Chesterland CCI***, and finished 6th in Kentucky at the Olympic Selection Trials in 1988. That was one of the biggest and most difficult cross-country courses I have ever jumped. This qualified us for the 1988 Olympic Team to travel to Seoul, Korea. Riding in the Olympics, and finishing 10th individually, has certainly been one of the high points of my life. I will never forget the feeling I had when I rode down the centerline of the Dressage arena in Seoul. I think I had tears in my eyes, and I was thinking, 'My God, I have finally done it. I'm here, riding in the Olympics!'. I looked up at the big electronic scoreboard in the corner of the arena, and it said: 'PHYLLIS DAWSON, ALBANY II, USA'. The feeling I had when I finished the cross-country course at the Olympic Games with no jumping penalties is a high I will never forget. It is something I had been working towards all of my life. Albany II and Phyllis at the 1988 Olympics in Seoul, Korea. Since then, I have had the privilege to ride and compete many really wonderful horses. I have trained quite a few young horses to the International levels, and had the good fortune to ride with the United States Equestrian Team on a number of occasions. Half Magic won Three-Day Events at North Georgia, Essex, NJ and Checkmate, Canada. 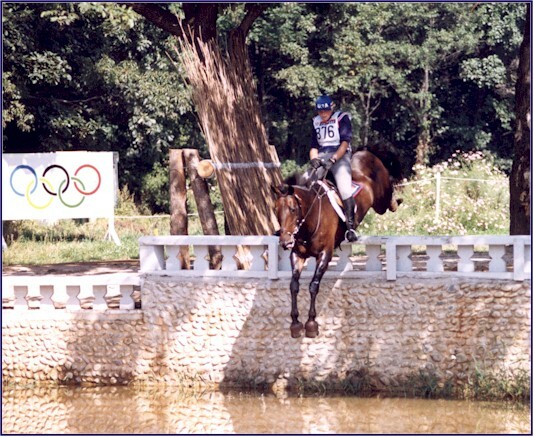 I represented the USA at the Open European Championships at Burghley, England, in 1997 on Snowy River. I twice completed the four-star at Rolex, Kentucky at the Lexington CCI**** on Star Bright. I have ridden around courses with a variety of horses, and all of them have been special individuals. The experience and mileage that I have gotten on all of these different horses has helped me develop the skills to select and train the elite competition horses that we now specialize in here at Windchase. To all of these horses of my past I owe a special debt. Their memories are dear to me. There is a saying that 'Good horses make good riders,' and I have been lucky enough to have the opportunity to ride some wonderful horses over the years. Visit Eventing with Phyllis for more information on her competitive career. To learn about some of the horses Phyllis has Evented over the years, go to The Competition Horses.